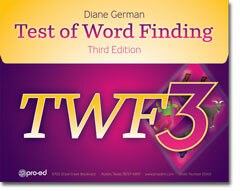 The TWF-3 assesses single-word expressive language. This edition adds new noun and verb target words; documents the absence of bias; updates the underlying lexical processing model; presents information on diagnostic accuracy and strong validity; and includes a Comprehension Check. Students with diagnosed word finding difficulties were included in the norming sample. There are four subtests (Picture Naming: Nouns; Picture Naming: Verbs; Sentence Completion Naming; and Picture Naming Categories) and five informal analyses (Phonemic Cueing Procedure, Imitation Procedure, and Substitution Analysis, to analyze errors; and Delayed Response Procedure and Secondary Characteristics Tally). Five informal analyses are also provided. Three of these analyses (the Phonemic Cueing Procedure, the Imitation Procedure, and the Substitution Analysis) examine types of word finding errors students make. The remaining informal analyses (the Delayed Response Procedure and the Secondary Characteristics Tally) contribute to interpreting the Word Finding Index. TWF-3 is individually administered in 2030 minutes. Subtest scores are combined for the overall Word Finding Index, and test results are reported as standard scores, percentile ranks, and age equivalents.